IWAKI Nordic can help you find the best solution for your application, whether it regards a simple pumping station, small storage tanks or complete integrated process plant for cleaning, mixing, transporting, storing or dispensing of aggressive and chemical liquids. 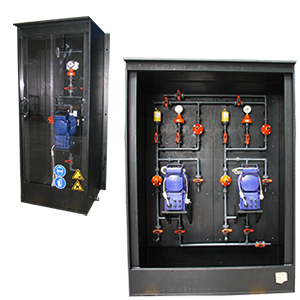 We assist in designing both smaller containers with connected pump, cabinets with metering pumps as well as large tank systems. See pdf-brochure (in Danish). 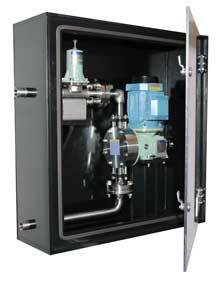 IWAKI dosing cabinets makes handling of chemicals more safe. 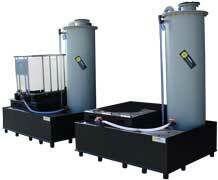 See our standard dosing cabinets and examples of some customized solutions. See our standard safety cabinets. The mobile unit is easy to move around between tasks. 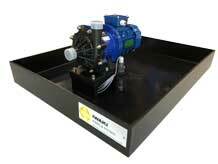 We offer three kinds of mobile units with AODD pump, dosing pump or process pump. See our standard mobile units. 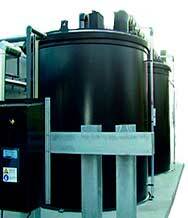 See our standard process units. 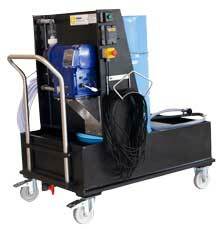 See our standard process equipment. See our standard basic safety equipment. In close cooperation with Weber Kunststofftechnik GmbH, one of Europe’s largest manufacturers in its area, IWAKI delivers plastic tanks and devices for storing chemicals and handling aggressive media. Depending on the details such as size, temperature and type of media the tanks are produced in composite and thermoplastic material. Read more about our standard and customer-specific artificial tanks and tanks for the pharma and food industry.